If you created your Cloud Firestore database in the Google Cloud Platform Console, and haven't connected it to a Firebase project, you don't need Cloud Firestore Security Rules. Those Cloud Firestore instances will only accept and return requests through your application layer. 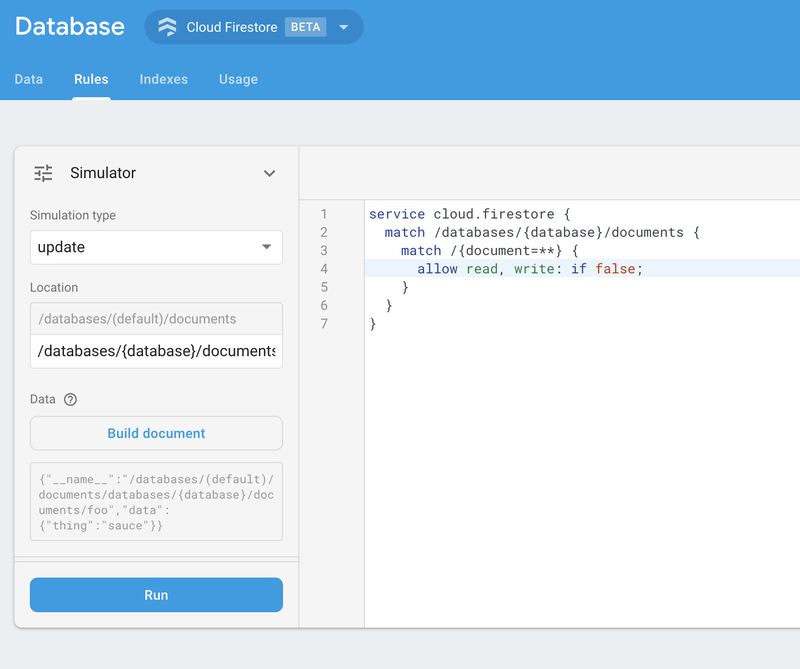 Cloud Firestore instances tied to a Firebase project (created in the Firebase console) allow clients to connect directly to the database and employ access control through Cloud Firestore Security Rules. To enable direct access for clients, import your GCP project in the Firebase console. If you've already added your GCP project to a Firebase project, it's important that you properly configure your Security Rules. The following documentation only applies to Cloud Firestore instances that were created with Firebase or have been added to a Firebase project. All Cloud Firestore instances tied to Firebase projects must have properly configured Security Rules to protect your data.